I first became a fan of Ari Goldwag when I heard Sheves Achim’s CD a few years ago (that’s not to say he wasn’t great before that, but I am relatively new to the Jewish music scene– the first CD I bought was Shwekey’s Leshem Shamayim to give you an idea). He is a brilliant composer, from hits like his own Kah Ribon to the wildly popular Yesh Tikvah by Benny Friedman. He also has a beautiful voice that is smooth and easy to listen to. I personally think that he is a very underrated artist and should generally be at the top of everyone’s list when they think of Jewish music. So needless to say I was excited when I heard about Am Echad. I am just getting around to writing a review because I had a baby a few weeks after I got the album! I personally prefer the first style, but I think it’s just a matter of taste, and I appreciate the diversity. It shows you how talented he is! This song is the same style as Yesh Tikvah- techno feel, Hebrew lyrics (not directly from davening or Tanakh), and a positive message, obviously this time with the overall theme of yachdus. See the music video featuring the adorable Moshe Dov Goldwag dancing for more on the message. It’s fun, inspirational, and a great start to the album. If you like Yesh Tikvah (who dosn’t?!?!) you will also enjoy Am Echad! Again, you can see what the song is about from the title. It’s upbeat and laid back and a nice song with a funky Israeli feel. However, following I must say its a little overshadowed by Am Echad right before it. It seems that Ari Goldwag and Benny Friedman have become musical best friends and for good reason– their voices go amazingly together. They both have a lot of power and sing with their hearts. It’s an absolutely gorgeous moving ballad. Another Israeli style song with modern fun music. Honestly, I don’t speak Hebrew, so I have a little trouble following this song, but I do enjoy listening to it! The first English song on the CD, this one is about saying the words, “I love you, Hashem,” etc. It is a nice song but a little long in my opinion. I love the concept of father and son singing together and these two are a great example. This song has a tropical feel and is very fun and upbeat. It’s sung with Israeli accents but the words are ones I am familiar with! I would love to see this pair put out an album together, or at least do more songs together. Love love love it! This is a follow up to Ari Goldwag’s beautiful song that we all know and love, Kah Ribon. It is very moving and heartfelt. I am not sure I like it as much as Kah Ribon, but that’s one of my favorite songs of all time so its tough competition. Definitely a worthy followup and one of the best songs on the album. Shows off his voice very well also. I love this fun, English/Hebrew song. The English lyrics and basically Gam Ki Elech translated. It sounds almost like he is ad-libbing and very authentic. I really like the mix of Hebrew and English and he does a great job of finding the perfect balance. As the title suggests, this song tells this story of Yosef Hatzadik. A lot of times telling stories in English lyrics can get cheesy and sound like a kids song. Although I think kids would enjoy this song, its not a kiddy song. It’s optimistic and uplifting. I am going to agree with HillelKAPS that this song sounds like a Sheves Achim song, but I also loved that album (are we going to get another one of those ?) so that’s a good thing for me. It seems a good chunk of it was recorded a long time ago, because I don’t know that any of these kids besides Moshe Dov sound like young boys anymore. This is a very fast song that will get you pumped. It’s very intense but happy. 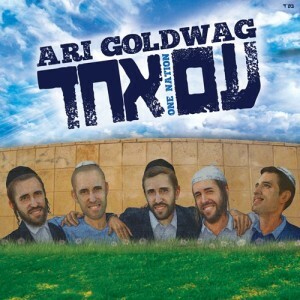 It’s mostly the kids singing in a back and forth, so it’s more like featuring Ari Goldwag. Speaking of which, I love the back and forth sort of battling spitfire style it has, as opposed to just taking turns. When you listen, you’ll see what I mean. This is a positive inspirational song about changing for the better (which we all could use , I think!) There are a lot of neat metaphors throughout and it’s very well written. This last track is a funky playful song about how, obviously, we are all imperfect! It talks about our imperfections– physical, flawed middos, etc., that we all have to work with. At the same time we have to take who we are, with our imperfections, and strive to be the best we can and always grow. Of the English songs, besides Gam Ki Elech if that counts, this is definitely my favorite. It’s a feel good song with an important message. An English version of “Hashem Tamid Itcha”. This album is high quality, with great compositions and vocals in one. There is a lot of diversity and something for each of us to relate to. It’s also a great CD for the family as kids will like the fun beats as well as great English messages. Enjoy! I’ve been enjoying this album tremendously! Its jam-packed with great songs one after the other.. My favorites are “Hashem is always here” (GREAT BEAT!) “Min Haoloam” (LOVE!) “Min Hameitzar” (STUNNING! )”Yosef” (HARTZIG)I got too many of them!! GO BUY!